I have always loved cast iron cookware. Just the sight of a beautifully seasoned cast iron skillet invokes warm memories of my grandmother's kitchen. My grandmother always had a pot of coffee brewing and something cooking on the stove. Her home was so welcoming. I remember that Grandma always seemed to be genuinely thrilled to have a drop-in visitor. My mother also made our home a haven with her excellent home cooking. 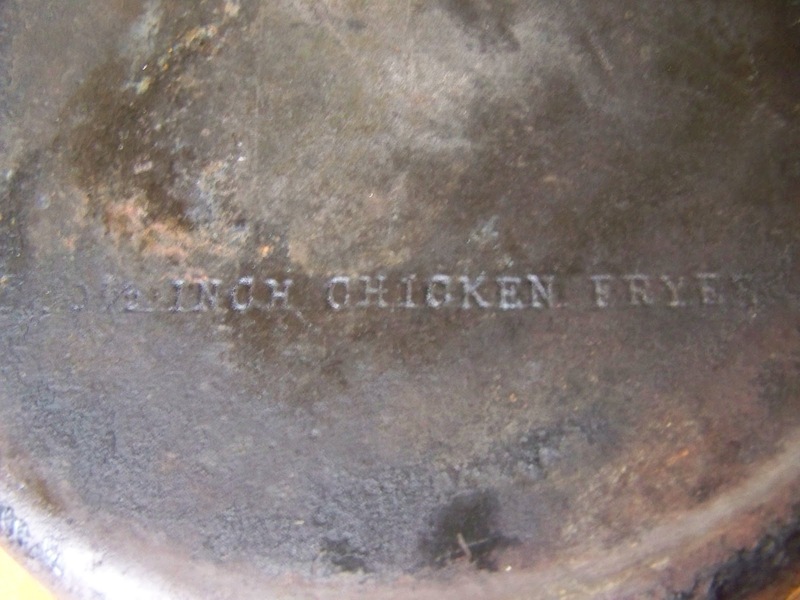 My grandmother fried chicken often in this skillet. Cast iron was often the cookware of choice in both of these dear ladies' kitchens. One of my earliest memories in the kitchen was that of my mother explaining to me that one must always dry cast iron thoroughly to avoid rusting. Mom always put her cleaned cast iron skillets on the stove top over low heat to dry. She rubbed oil on her cast iron pans periodically to help keep them "seasoned". Since I've grown up, I've discovered that not only is cast iron durable and beautiful, it may offer health benefits as well. Apparently cast iron adds a certain noticeable amount of iron to foods cooked in it! This makes sense but it's nice to have professionals in the health care field confirm it. When seasoned properly, cast iron offers a fantastic non-stick surface which makes it a great choice for sauteing and frying. Well cared for, cast iron will last virtually forever. It's very simple to care for your cast iron. made a great place to sit! Don't store food in the pan. This can cause your "seasoning" to break down. Don't put cold water in a very hot cast iron pan. It could cause cracking. This is something I've done many times and luckily didn't experience cracking but the potential exists. Now that I know this could cause breakage, I won't be doing THAT again! It isn't a hard and fast rule but I try to never use soap on my cast iron. I just physically remove the food debris and rinse. 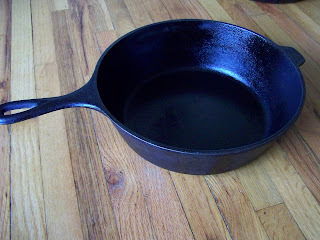 Since I dry my cast iron on a burner, I feel any bacteria that I might be concerned with will be killed in the process. ﻿Seasoning your cast iron is really very easy. Whether you've purchased a new "unseasoned" pan or have an old pan that needs seasoned again the process is the same. 1) Coat the entire surface of your pan, inside and out, with vegetable shortening and place in a 275 degree oven for an hour or two. It will have a smell, so don't be alarmed. I don't find the odor offensive but I suppose I associate it with a good thing so it doesn't bother me. 2) Take out of oven and wipe off any excess shortening. You may wish to line the bottom of your oven with foil or put a baking sheet under the cast iron in order to catch any drips of liquefied shortening. 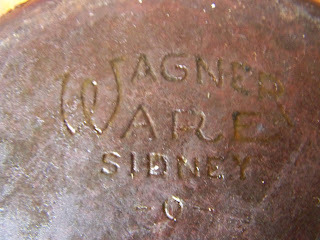 One of the visual appeals of cast iron to me is that there are often markings from the manufacturer. 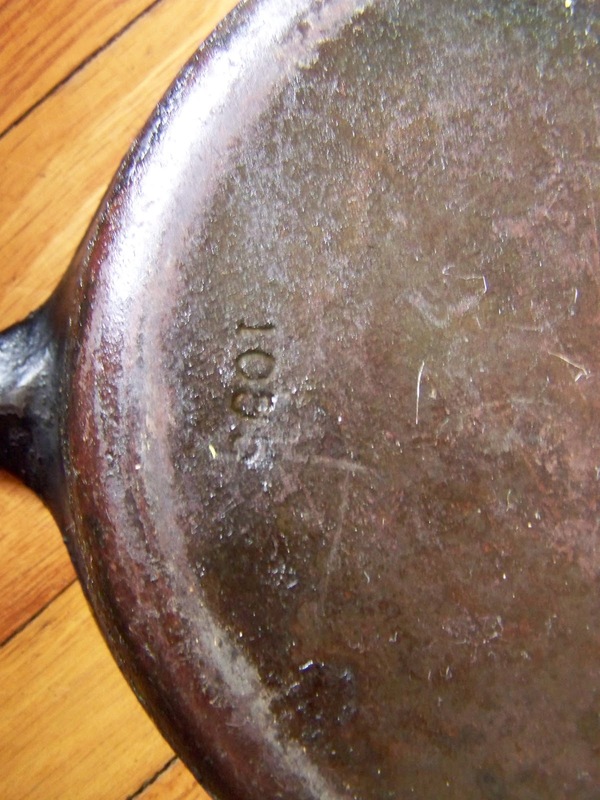 Most products of course have a manufacturer's marking but for some reason I can't explain, I find the markings on cast iron incredibly beautiful. makes a very nice pre-seasoned one. great tips!! We cook with cast iron too, we bought it 37 years ago,, still great! I think cast iron just gets better with age and use! Thanks for sharing! I have such a soft spot for cast iron! It's not sad! As long as you are using them, they're probably getting all the upkeep they need! Thanks for stopping by! I have cooked with it for years and use my grandmother's pan that they got as a wedding gift in 1918. 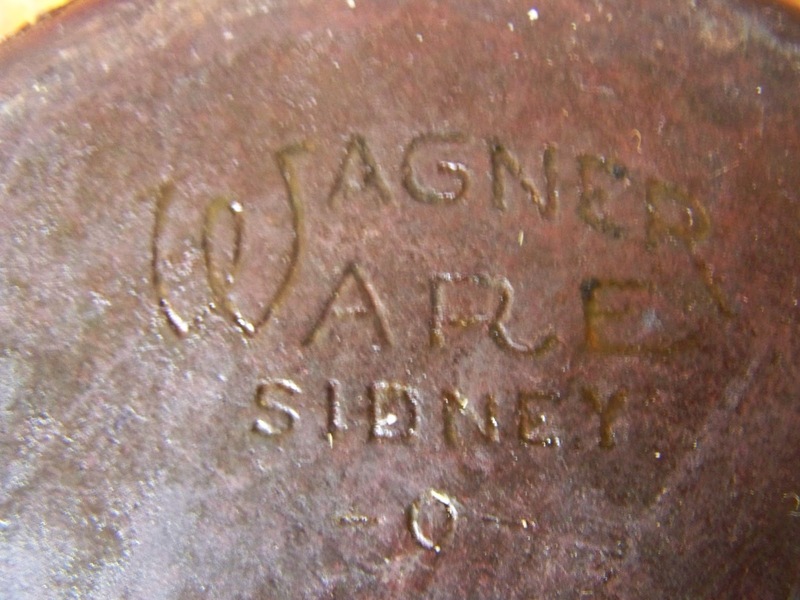 Anyway it is best to buy antique ones as most of the new pans are simply rough cast iron, you can see the imprint of the sand where the food goes. The old pans are actually machined smooth so that the surface is more "non-stick" I have seen machined ones new but these days they mainly sell the cheaper rough ones. I have also heard that some off brands are from China and may contain impurities in the scrap metal that they are made from. You get extra iron in your food especially if you fix acid foods. Thanks Sunnybrook! I learned something new! That explains why one of the pans we bought new for camping is so rough. I really like using my inherited ones the best. I LOVE my cast iron. I've never heard the thing about not using metal utensils though... I always use an old metal spatula and it seems to work great. The things I try to avoid putting in mine are cheese and tomatoes. The cheese ALWAYS sticks and then I end up ruining the seasoning to get it clean. And tomatoes just seem to dissolve the seasoning or something... maybe it's the acid. Anybody know? I've actually heard that you shouldn't put tomatoes in your cast iron too! But, I am by nature a rule breaker and I have definitely cooked my share of tomato sauces in my cast iron. I think my seasoned finish is still okay because I tend to wipe the surface after it's cleaned with a thin coat of vegetable oil. I love my cast iron and feel better using it versus the non-stick pans that I've read put off toxins. Avoid toxins is an excellent reason for using cast iron! Whether those toxins be from a non-stick pan OR from an aluminum pan! My wife and I have always used cast iron. I really don't understand why there is anything else! You make a very good point Clint! Why bother with anything else??? I also love cast iron. This was a really sweet, fun and useful post! Thank you Jill! I sure appreciate your visit! I have one well seasoned cast iron pan. I never use it but recently a young boy told me how he cooks the best collards in them and I have been going to dig it out and try it. I hope you'll tell me how your collards turn out! Sounds delicious already! Thanks for stopping in Becky! The skillet your baby is sitting in has to be the biggest one I've ever seen. How do you lift it? It must weight a ton! It is huge! She's two years old and could probably take a bath in it! LOL It is heavy, especially when full of food. I try to only lift it when it's empty. We really use this one the most for camping. It was a gift (I begged for it) from a friend. He used it camping and when sold his camper, I convinced him that it should be mine! You simply cannot beat cast iron! I use it for frying skillets, baking pans, soup pots etc. its my surface/cookware of choice without a doubt! Its a life time pan also so its very economical! I even have a cast iron tea kettle I use as a humidifier on our wood stoves, a few drops of essential oils in it and it also makes the house smell good! It sounds as though you've got a great collection of cast iron. I wish I had a cast iron tea kettle and cast iron bread loaf pans. Beautiful collection! I love your Grandma's chicken frying skillet. Grandma's pan is pretty special to me! I have a lot of good meal memories that revolve around that pan! Yes EcoCatLadt, cooking anything acidic in a cast iron ware, including tomatoes, will remove some of the patina, but if it is a well seasoned one the patina will reappear in no time and no harm was done to your cast iron ware. Thanks Norma! I've actually switched to making my marinara sauce in the stainless steel Dutch oven as opposed to the cast iron one, and it works well. All of the cast iron skillets maintain their seasoning really well, but the deep dutch oven is always getting something stuck in it and then I end up destroying what little seasoning there is in the process of trying to clean it. I may try Poppy's re-seasoning trick, but I think I should wait until it's above zero outside so I can open the windows when it start to smoke! Either that, or maybe I should just come up with something really greasy to cook in it on a more regular basis! p.s. - Is there a difference between "patina" and "seasoning"? I honestly don't know if there is anything different between patina and seasoning! 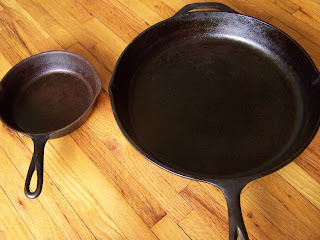 I would think they are one and the same as a well seasoned pan has that beautiful "patina"! But I'm not an expert on, just a lover of, cast iron cookware! So cool to hear it Heather! I do hope you'll use your grandma's pans! Good memories for you and for the future! Wow! 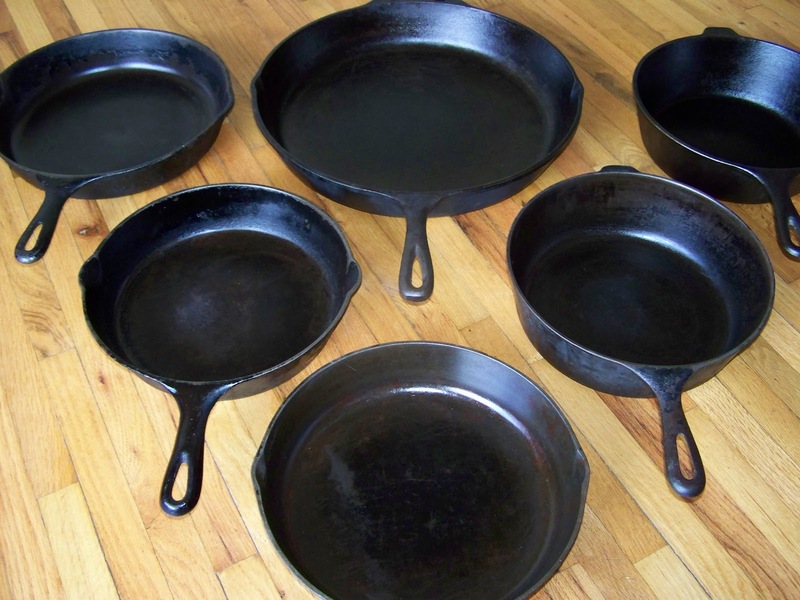 So cool to have all of those pans- I do believe cast iron is a family heirloom! I love cooking in cast iron too. My daddy passed that down to me! Thanks for sharing! It makes me happy to hear of other families passing down their cast iron. Cast iron is truly a useful treasure! I love my cast iron cookware. It's perfect for my wood cookstove too. Love the symbols on the bottom of the pans. Thanks Leigh! I sure wish I had a wood cookstove to use mine on! That is true old fashioned cooking! I am also a huge fan of cast iron cookware. I think it is so neat that so many have pans left to them by grandparents or parents. My husband was given his grandad's well used and memory filled cast iron fry pan upon his grandad's passing. My hubby uses it to cook's his grandad's family famous 'tin pancakes'...yes, tin..not thin. My hubby's grandad was from Denmark and his accent..well..you know. We have accumulated many cast iron pieces over the years, big and small! Love them all! Thank you for visiting and sharing a charming family history! I would love to see photos of your cast iron if you ever get the chance to post them! My favorite cast iron skillet is over 70 years old! Another good thing about cast iron is that it's so cheap compared to other cookware. Thanks so much for stopping by and introducing yourself. That's one cute little girl in the skillet!! Thanks Bonnie! It is really inexpensive compared to other cookware. Hard to believe that you can get such longevity for so little money! Yes, that little girl has me and her daddy both wrapped around her tiniest finger! She's our sunshine! What a precious pic of skillet tot!!! Priceless!!! 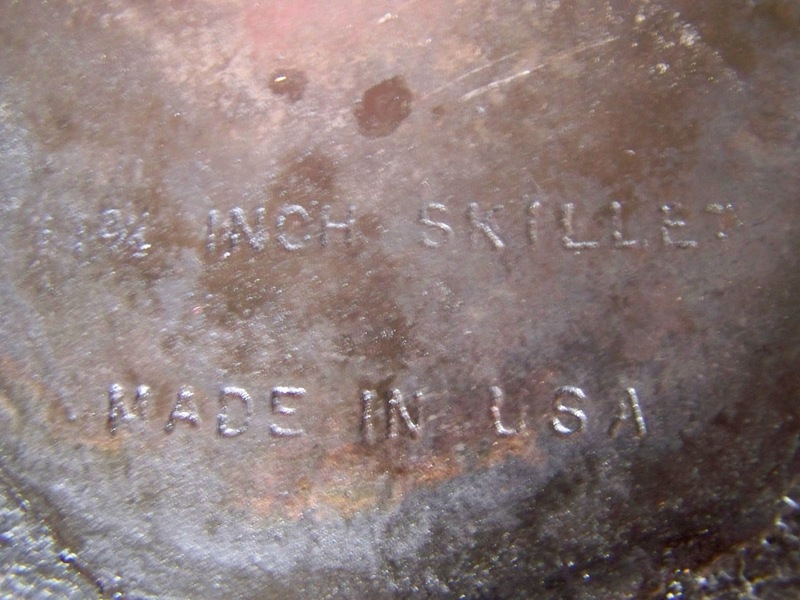 Great directions on keepin' your cast iron in good condition. Thank you Nezzy! 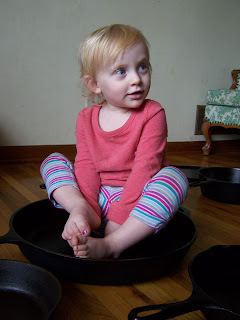 My girl thought the skillet made a good seat! I couldn't resist the photo! Too cute! I love cast iron skillets, dutch ovens, baking pans (hard to come by though). I agree with you, once you get use to it, it is very easy to maintain. Best part: well maintained cast iron skillet is 10 times better than any non-stick one. Great post! I am your new member now. Thank you Marina! It is an honor to have you here! And I'm with you, it is much better than any other nonstick pan out there! Welcome and have a wonderful day! I too love cast iron cookware. I find them at thrift stores, garage sales...and even in a garbage pile on one occasion! I always check the markings on the bottom as well and only buy them when they've been made in USA or Canada. My favourite oil for seasoning is coconut oil. I was interested when I learned that cooking tomato based foods in them hugely increases the amount of iron (makes sense but I hadn't really thought about it before). I sometimes use olive oil but never thought about coconut oil! My mom is on a big coconut oil kick right now so I suppose I should give it a try! It's interesting the different perspectives on tomato based foods with cast iron. I've heard you shouldn't cook tomatoes in cast iron but I've also heard you get more iron if you do! I've made tomato based foods in mine many times but always wipe a coat of oil on the cleaned pan afterwards. I didn't dry mine properly and it rusted. I need to get a new one and start again. My mom always cooked with her cast iron pan. I don't know how I have survived without it. I love cast iron cookware and I'm in the process of replacing my pots and pans with cast iron ones. I just wonder: would cast iron also work on ceramic/induction cooker tops? I live in Norway (northern Europe) and I'm really glad I found your site... lots of amazing tips. Thank you! Thank you for visiting our site, I'm so glad you find it helpful! I did a little research and it appears that cast iron is perfectly fine to use on a ceramic/induction cooktop. Visit this link to read one of the articles http://en.wikipedia.org/wiki/Induction_cooking . Be sure to subscribe to get our latest helpful tips! Have a wonderful weekend!